I am back again this month with another fun post with my Cricut Explore. 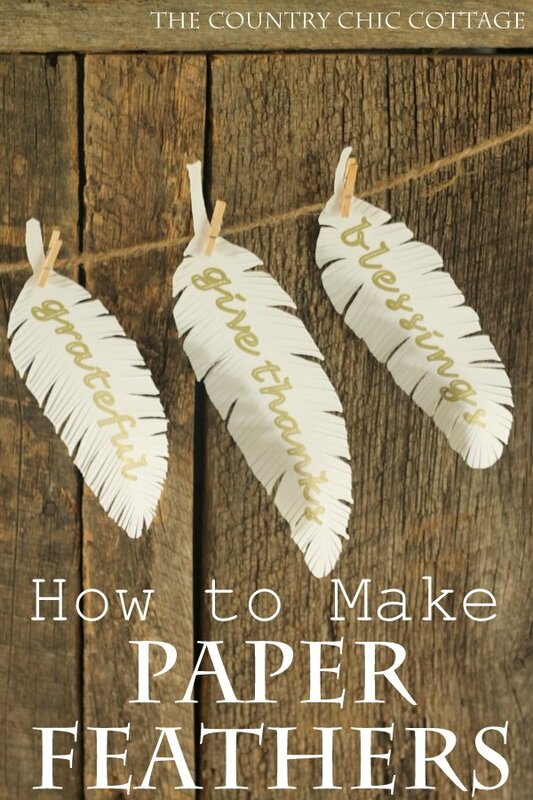 You can learn how to make paper feathers below for your own home. This post is not sponsored by Cricut in any way however I am entering it into a design competition. So y’all cross your fingers and toes for me m’kay? 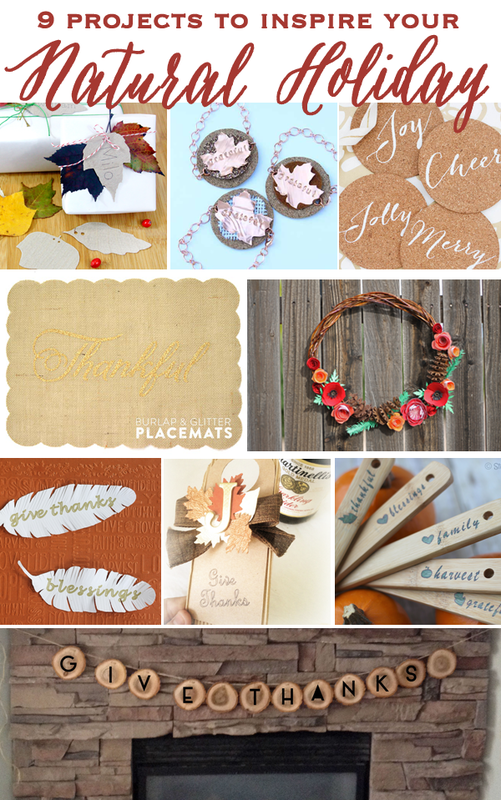 You can see even more nature inspired crafts from my fellow Cricut team at the bottom of this post. Click around the OUTSIDE of the image until you have something that looks similar to the below image. Yep now we have it isolated and all by itself! When you click the continue button it should look like the image below. If it does not, go back and try again before saving. Now add text to the image of your choice and put that text right over the top of your feathers. Click that text layer on the right hand side and pick WRITE instead of CUT. Be sure the text is positioned just how you want it to be. Then pick the feather and the text by holding down the shift key and clicking both. Click “ATTACH” on the right hand side in the layers box. Your feather is now ready for cutting and writing. When you click GO in the Cricut software you should get something that looks like the below image. Be sure that your feathers and writing are on top of one another. If it does not look similar to the below the writing will not be on top of the cut out feather. Go back and follow the above steps again to get it right. 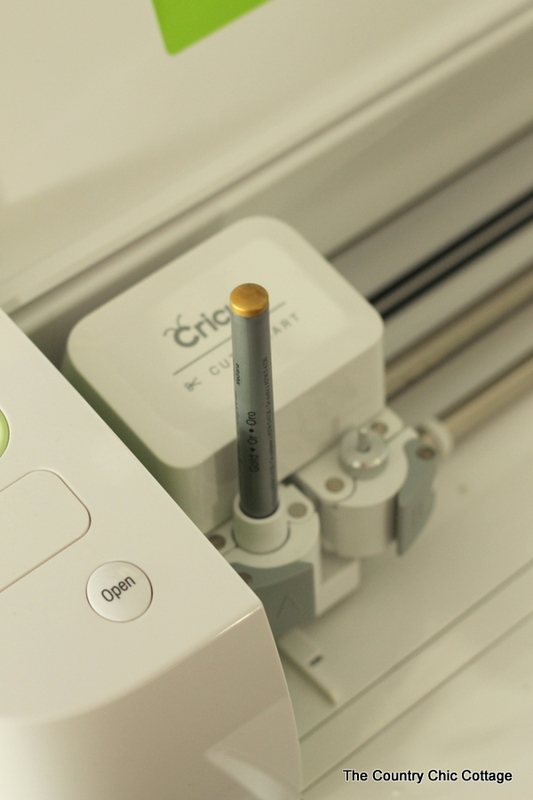 You are going to need to insert your marker into the Cricut Explore before continuing. There are only certain markers that will work properly with this machine. 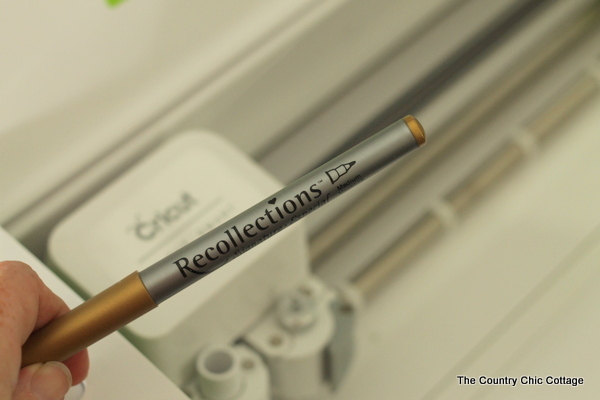 I did extensive research before purchasing the Recollections brand. Please do your research if you are going with a different brand. Place into the Cricut Explore firmly so that it seats all the way down. NOTE: The cap is removed and I opened the clamp before inserting. 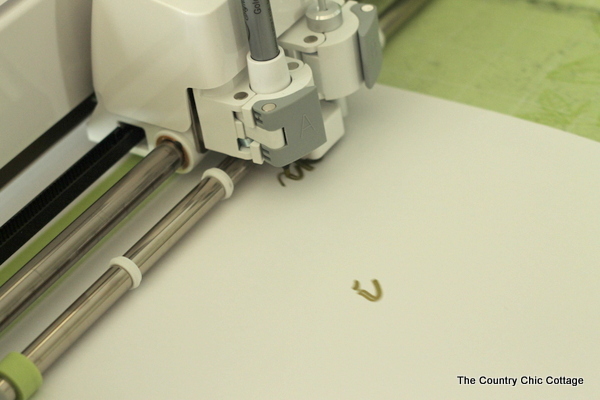 Now we can finally load our mat with paper and hit “GO” on the Cricut Explore. You can see the machine writing before it starts to cut. If it is NOT writing first then the marker is probably not seated properly. Stop the machine and readjust. The cut feather will look like the top feather in the image below. But we want it to look more like the bottom feather. Just use a pair of scissors to give the feather more fringe. Now that you have your gorgeous handmade paper feathers what are you going to do with them? Well they make fabulous holiday home decor. I like stringing them up as a banner or just laying them in a bowl. You can also use them for your Thanksgiving table setting this year. Whichever you choose, these handmade paper feathers are sure to be a hit in your home. 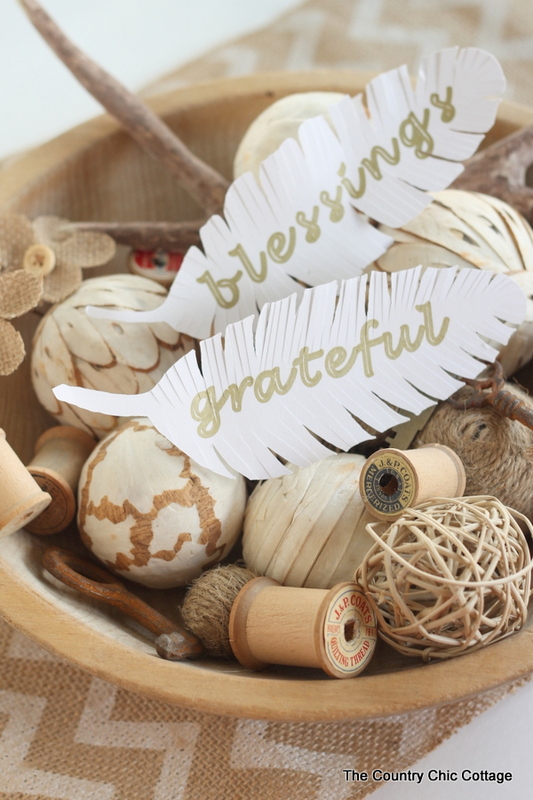 Will you make paper feathers for your home? Where will you use your creations. 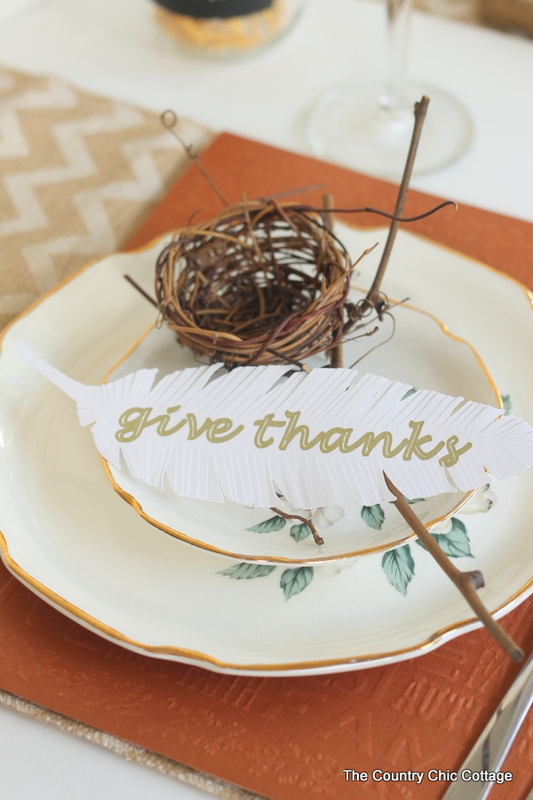 Be sure to pick up the Cricut Explore as it makes it so much easier to make these beauties! I promised y’all more nature inspired crafts with the Cricut right? Here is the rest of my Cricut team and their amazing creations. These look great! I love how easy it was using the Cricut. I love how the pen will write for you on the design! Love the gold look too. Cute! I love them displayed in the bowl. I love how these turned out Angie! So pretty! Lovely for a Thanksgiving banner! So cool! I especially love how it writes with the pen! Wow! I love this! They look so great and would be perfect for a Thanksgiving table. I love anything involving feathers — these are super cute!